A compelling email or clever push notification can remind a user to come back to your product. But you may only get one visit. One conversion. What if there was a way to keep people coming back again and again—i.e., to create loyalty? By applying the same 3-part loop that compels you to brush your teeth every morning or reach for chocolate when you’re stressed, you can transform a primary user interaction into a habitual behavior. As Nir Eyal explains in his book Hooked: How to Build Habit-Forming Products, people are inundated by distractions—and turning them into loyal users has grown more expensive and challenging than ever before. If you can’t carve out a space in your user’s daily, weekly, or monthly routine, they may not remain your users for very long. Before you can successfully build habit into your product, you need to understand how and why people form habits. Let’s start with the basics. How many times have you left for work and wondered whether you locked the door or turned off the coffee pot? Invariably, when you go back and check, the door’s locked and the coffee pot cooling, even though you have no memory of doing these things. Why? Because we relegate certain repetitive functions to a primitive area of our brains called the basal ganglia. This frees up the cerebral cortex to tackle higher-level functions—like the meaning of life, and how your onboarding flow ought to work. In short, habits free up mental RAM so you can operate more efficiently. You know that old saying that we’re creatures of habit? It’s totally true. A 2006 Duke University study showed that more than 40% of the actions we perform every day are driven by habit. That’s right: nearly half of what you do every day is automatic, unconscious. This may call into question the age-old idea that the key to ongoing engagement is staying “top of mind” with customers—by appealing to the thinking part of the brain. Instead, focusing on tapping into subconscious behaviors may be the more effective way to get someone hooked on your product. Neuroscientists have discovered that once a habit has been etched into our brain, it never really goes away. But if that’s true, how do people stop smoking or watching Project Runway religiously? Typically, they don’t just drop the habit—they exchange it for a new one. Much like a girlfriend or boyfriend, old habits can be substituted for new ones. So while we can change a neural pathway, the right trigger can reawaken an old habit any time (like getting a text from an ex). A cue is “a trigger that tells your brain to go into automatic mode and which habit to use.” Triggers can include places, times of day, emotions, and more. In response to the cue, you perform an action. It can be a physical action like drinking coffee, or a cerebral one like Googling a question. This is the benefit you get from completing the routine. It’s the part that proves to our brain that the action is worth repeating. It can be a variety of things such as a boost of energy when you’re tired or quickly finding an answer to your question. 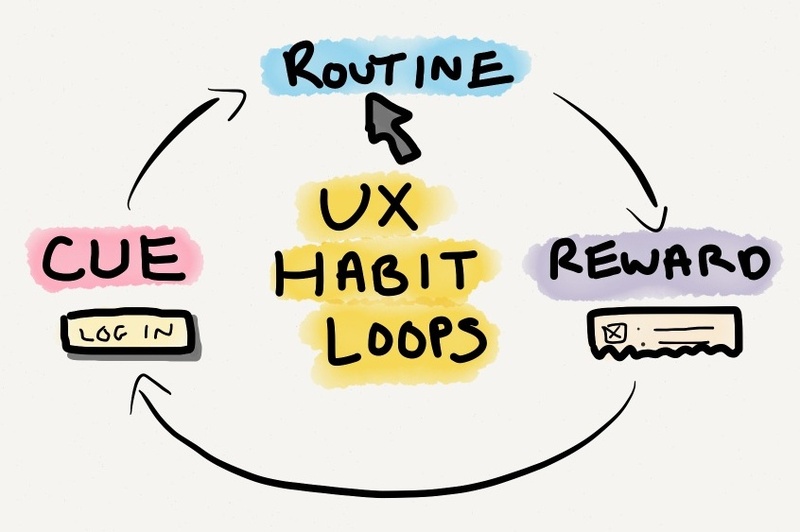 In part 2, we’ll talk about different ways to apply the habit loop to a product and share ideas and examples of how you can successfully embed routine-sparking elements into the user experience. Stay tuned! Dina is the Director of Product Strategy at Prolific Interactive, a mobile-focused product agency serving brands such as Sephora, American Express, 23andMe, Gap Inc. and HBO. With more than 10 years experience building and growing startup and enterprise products, Dina helps companies create experiences that strategically balance business goals and user needs. She frequently speaks and writes about how to use consumer psychology to better understand user habits and serves on the leadership team of mBolden in San Francisco.